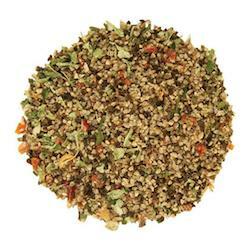 Enliven just about any dish with this blend of rich spices. Use while cooking, or at the table. Directions: Sprinkle on pasta, vegetables, tofu, meat, poultry, seafood, or fish. Ingredients: organic black pepper, onion, garlic, celery leaf, bell peppers.